Italian Baked Spaghetti Squash with veggies, Italian sausage, cheese and marinara! You may never have pasta spaghetti again! 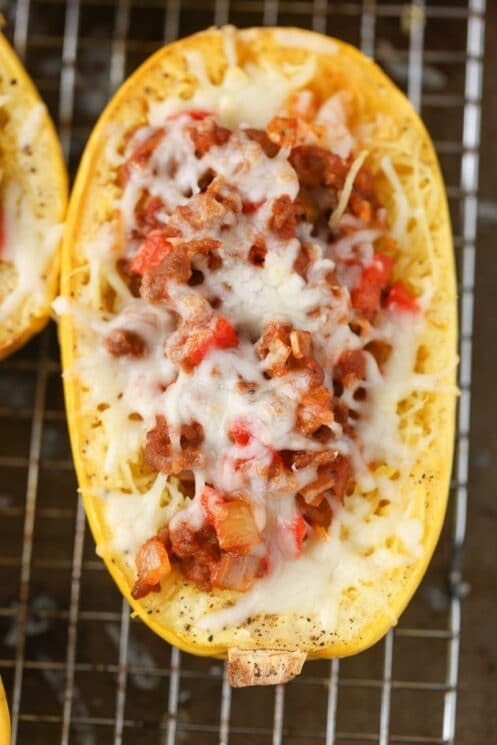 Spaghetti squash is like magic! You cook it in the oven and when you try to flake it with a fork it breaks into strands that look like spaghetti! It’s so fun to see the transformation and your kids are going to love helping you in the kitchen with this recipe. 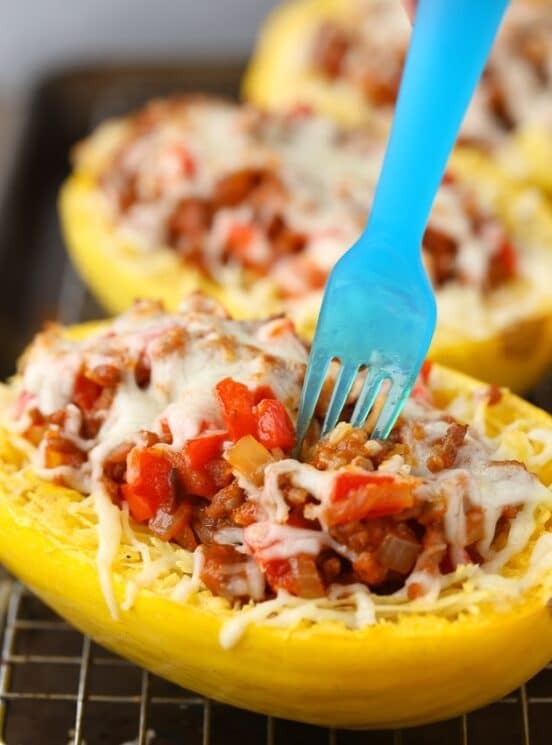 This Italian Baked Spaghetti Squash is one of my all-time favorite meals. It’s hearty because of the sausage, but the squash keeps it from feeling like a heavy meal, and of course the cheese on top bubbles to perfection! If your kids love spaghetti, they will love this! 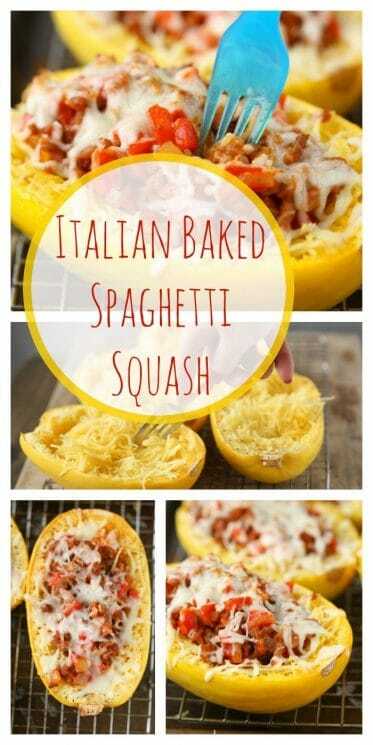 You can serve the squash inside the squash halves (you can cut them again into quarters) or you can flake all of the squash out and serve it like traditional spaghetti on plates and spoon the meat sauce on top! Here’s my squash halves before they went into the oven, all oiled and spiced up. Spaghetti squash has a very mild flavor and, unlike other winter squash, does not have much sweetness. So you can use spaghetti squash in both savory and sweet dishes. Consider eating it warm, topped with pasta sauce or tossed with a small amount of olive oil and fresh herbs, or serve it chilled with sun-dried red peppers, olives and feta cheese. So many ways to serve this type of squash. Our recipe for Italian Baked Spaghetti Squash is one that will be familiar to kids, and might get them loving spaghetti squash if they haven’t eaten it before. 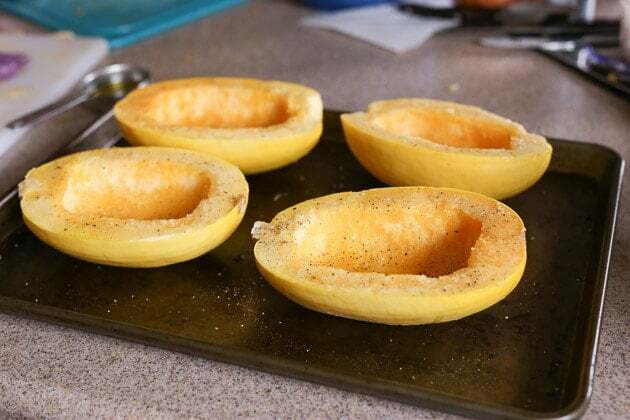 While your squash is baking in the oven, cook the filling. Is Spaghetti Squash Good for You? Most varieties of winter squash contain almost twice the calories per serving of spaghetti squash, which has only 42 calories per cup. This is why a lot of people like to substitute it for pasta. It’s also very low in fat, with less than 0.5 grams of fat per cup. It will fill you up without adding a lot of calories or fat to your daily total. But does it also contain nutrition?? Yep – it sure does! 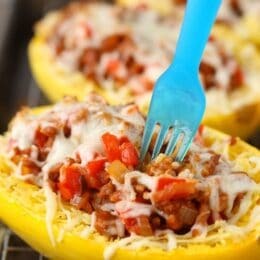 If you are looking to get vitamins from the food you eat, spaghetti squash is a great one. 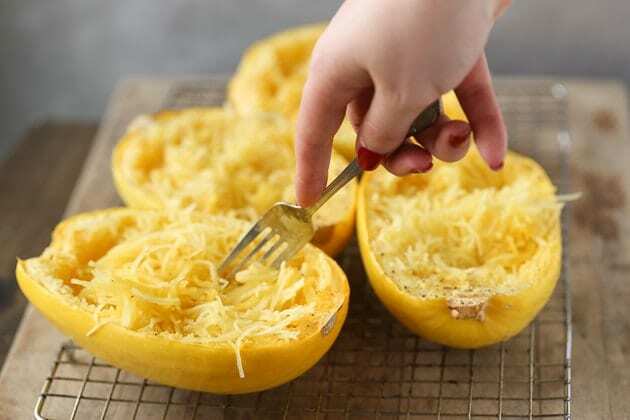 You will get small amounts of almost every essential vitamin from eating spaghetti squash. Vitamin C and vitamin B-6 are the vitamins found in highest concentration in the squash. Vitamin C plays a role in the growth and repair of body proteins, aids in wound healing and supports your immune system. It’s also an antioxidant that helps defend your body against harmful free radicals. Vitamin B-6 is involved in over 100 enzyme reactions in your body, including energy metabolism and hemoglobin production. As far as minerals go, spaghetti squash contains every essential mineral in trace amounts. One common and important mineral that spaghetti squash contains, potassium, plays a part in maintaining proper muscle function in your body. It also functions as an electrolyte, helping to regulate fluid balance and the acidity, or pH, of your blood. Replacing electrolytes is essential any time you sweat heavily or lose body fluids. I’m obsessed with this recipe. Sometimes I feel like people don’t give enough credit to squashes, there are so many amazing recipes that come from them. You don’t just have to chop them up, cook them and eat them. 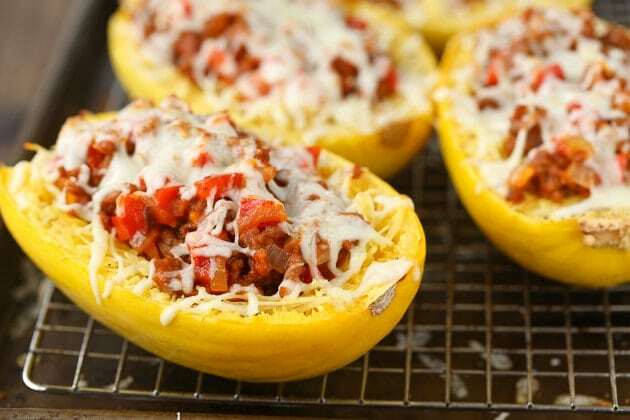 Incorporate them into the meal like this delicious Italian Baked Spaghetti Squash! Or make them into a Creamy Butternut Squash Soup! Cut both spaghetti squash in half lengthwise and scrape out the seeds. Oil the halves and season with salt and pepper. Place on a cookie sheet and bake for about 30 minutes or until soft. While the squash bakes, prepare the filling. Place the sausage in a skillet over medium heat. Use a wooden spoon to break up the meat. Once cooked, remove from pan. Dice the onion and peppers and add to the pan. Saute until the veggies are soft. 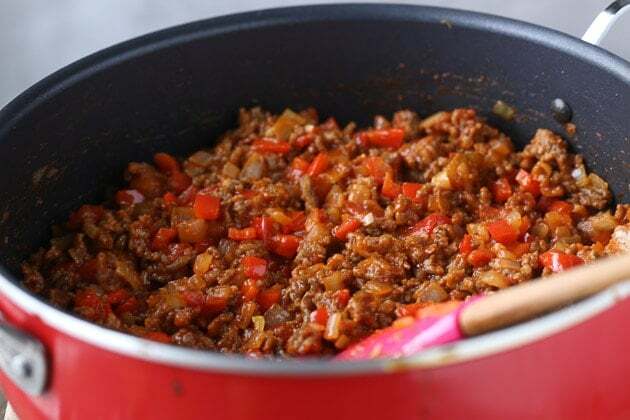 Mince garlic and add to the pan with veggies, cook for 1 minute. Add the meat, marinara and salt. Stir well and remove from the heat. When the squash is done, use a fork to fluff up the squash. It will flake apart and look like spaghetti! Top with the filling; divide among the squash halves and top with shredded cheese. Broil in the oven until the cheese is melted, about 2 minutes.